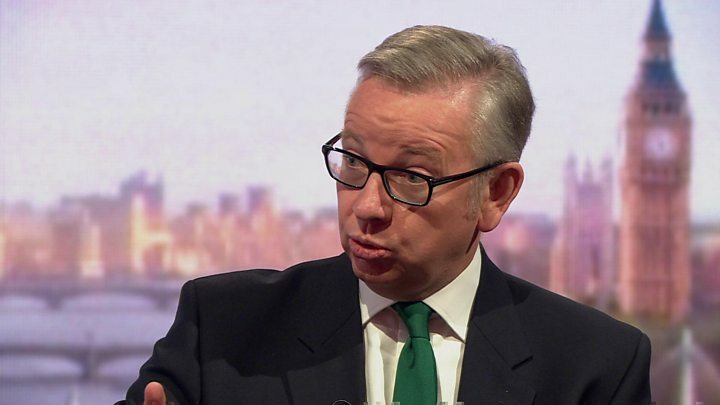 Michael Gove has urged Tory MPs to back a compromise Brexit plan as the best chance of a "proper" exit from the EU.He told the BBC it was not all he hoped for, but said he was a "realist" and dismissed claims it would leave the UK as a "vassal state".But he warned the EU had to be more generous or the UK would have no option than to walk away without a deal.Labour also urged the EU to be more flexible but said Theresa May's customs plan was a "fudge" and would "unravel". Several Tory MPs have expressed unease since Friday, when the cabinet approved a document setting out the UK's vision for its future relationship with the EU after it leaves in March 2019. Under the proposals, yet to be presented to the EU, there would be a free trade area for industrial and agricultural goods, based on a "common rule book" and a "combined customs territory". Boris Johnson is understood to have strongly criticised the plan during the cabinet meeting at Chequers before signing up to it. He is said to have warned colleagues it could be a "serious inhibitor to free trade" and striking deals with other countries.The foreign secretary then backed the proposals - despite claiming that defending the plans was like "polishing a turd". But environment secretary Mr Gove, who campaigned for Brexit alongside Mr Johnson in the 2016 referendum, told the BBC's Andrew Marr show he was satisfied the solution would "honour" the result of the vote.The free movement of people was ending, he said, and the UK Parliament would have the final say over rules governing a "huge swathe" of the British economy. "In all the important areas where an independent country chooses to exercise sovereignty, the UK will be able to do so and, in so doing, respect the referendum result and the mandate we were given," he said.Asked if Mrs May's offer was all he had hoped for, he replied: "No, but then I'm a realist and one of the things about politics is you mustn't, you shouldn't, make the perfect the enemy of the good." While urging his colleagues to get behind the prime minister as she tries to secure a deal by October, he said the UK must be prepared for this not happening. "We are being generous to the EU, we are showing flexibility," he said. "If the EU is not generous and flexible, we may have to contemplate walking away without a deal. "No-one wants to walks away now because we are in the middle of a negotiation - what we need to be able to do is to walk away in March 2019." 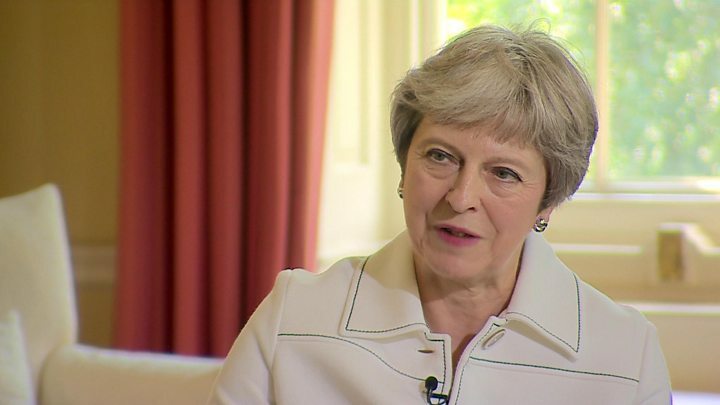 Theresa May tells the BBC: "We will bring an end to free movement"
After ministers signed up to the deal on Friday night, Mrs May said the time for them to air their concerns in public was over and collective cabinet responsibility had been re-instated - a stance endorsed by Mr Gove.The prime minister has urged the EU to take her offer seriously. She refused to rule out offering EU citizens some form of special status as part of a proposed new "mobility framework". Friends of Mr Johnson say he is staying in the cabinet to "make the argument for Brexiteers". But Tory Brexiteers not in the government have spoken out against the plan, warning the UK will have to follow EU laws and European Court of Justice rulings and not have an "effective international trade policy".Conservative MP Andrew Bridgen said the proposed deal was "indefensible" as it was "probably worse than staying in the EU". He suggested his support for the prime minister was not unconditional. "At the moment, she's not only let the party down, she's let herself down," he told the BBC. "If she sticks with this deal, I have no confidence in it. If she sticks with this, I will have no confidence in her." There will be different arrangements for trade in services, including financial products, with greater "regulatory flexibility" and "strong reciprocal arrangements"
A new customs arrangement will be phased in, with the goal of "a combined customs territory"